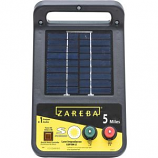 Zareba Systems — your complete source for designing and building an electric fence that will safely control whatever animal you've got, from small pets to horses or cows. Electric fencing provides effective and economical animal control. 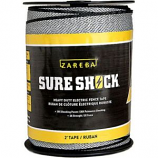 It's safe, reliable, is easy to install and often lasts longer than conventional or barbed wire fence. Animals quickly learn to avoid the short, safe pulse of electricity. Heavy duty electric fence tape. 2X strength. . . .
5-mile range. For use with small animals and pets. Built-in mound fits t-posts round and wood posts y-posts and flat surfaces. . .
Increases the tension on the fence wire to about 250lb. Strainers should be installed every 2500 feet. . . .
AC-powered charger for all types of electric fences including high tensile polywire and polytape. 25-mile range; delivers safe effective high-voltage shocks with digital timing. 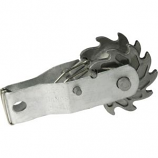 Handles heavily weeded conditions; low-impedance design maintains maximum energy on the fence. Fence OK indicator light; clearly labeled color-coded terminals for easy set-up. .